In the coming weeks, I have acquired a lot of calculators and plan to give a short review of each. They include, the original Hewlett Packard HP 10B, Casio EL-5500 III, and the Calculated Industries Construction Pro/Trig App. More fun with the HP 12C! (The HP 12C is on my list of top ten calculators of all time - the other nine I have to think about... subject of a future post?). I like using the HP 12C for a variety of applications and not just strictly finance. Here are four more programs, enjoy! The program will require the user to input and compute the annuity variables [ n ], [ i ], [ PV ], and [PMT] ([FV] if a balloon payment is required). Then enter the period # where the loan is paid off (k), and press [R/S]. Example: On a 48 month purchase of a $20,000 car, financed at 5%, the purchaser pays the car off early after 24 payments (k = 24). What is the rebate? 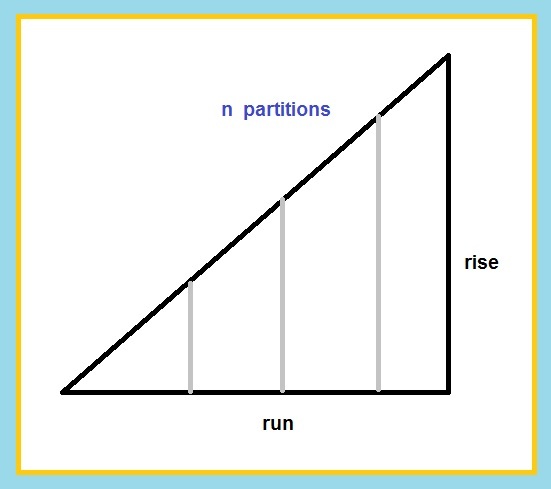 The program finds slices a right triangle into equal parts. Using similar triangles, the bases and heights of similar triangles are found. 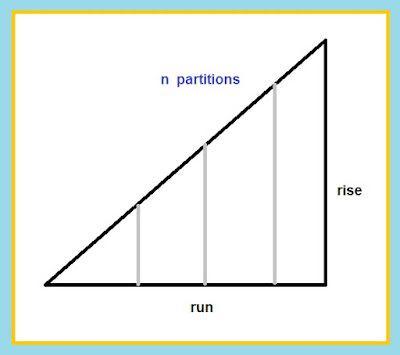 If n is not 1, 2, or 3, an error occurs. Keep in mind: this is done on the HP 12C (regular). For the HP 12C Platinum, the code for Last X is 43, 40 ([ g ] [ + ]) and the step numbers are three digits (000 instead of 00). g = Earth’s gravity. For in US units, g = 32.1740468 ft/s^2. The projectile will have maximum range (distance) if we aim the object at 45°. Now we can use the second derivative to test whether the function is at a maximum (less than 0) and minimum (more than 0) at the crucial point. Since the second derivative at θ = π/4 is negative, the range is at its maximum. Very useful information and program instructions with HP 12C calculator. Thank you! I love working with the 12C. I wasn't a fan at first (we're talking 20 years ago), but it grew on me. It's one the of the best calculators. Many thanks Eddie once again for a superb article on programming a calculator. Would love to read about your top ten all-time-favorite calculators! I think it would be interesting to see which company's calculators tug at your heart (and head) the most. Thanks again for all your posts and your incisive videos on YouTube also. Thank you, Joseph. I have made not made the list yet. I have four definite calculators so far.